Homes are selling like its 2006 all over again. Contracts to buy home reaches 9-months high. Where the economic tides go so goes the the housing market typically. That is why continued strength in the US economy has led to continued strength in the housing market recently, especially with first-time homebuyers. The National Association of Realtors® (NAR) reported recently in their monthly numbers that sales of existing homes in May were at the highest rate in nearly six years and April sales, originally reported down by more than 3 percent, weren’t hit as hard as first thought. If not for the Homebuyer Tax Credit in 2009, today’s numbers would be the highest in more than 8 years. 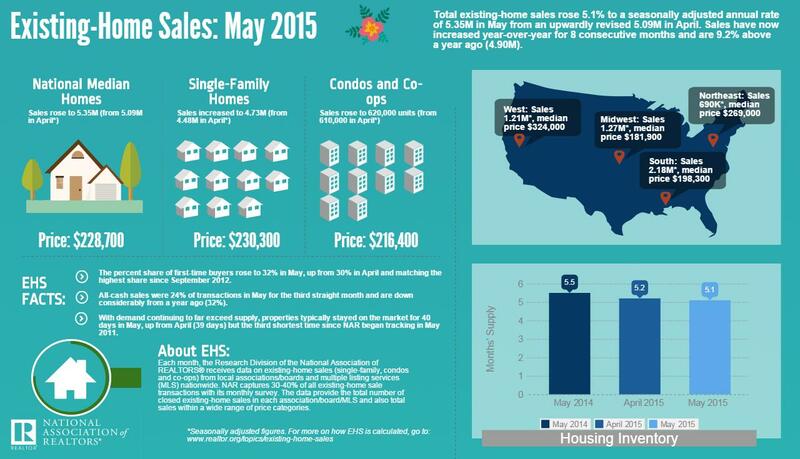 Sales of single-family homes, condominiums, townhouses, and coops pushed 5.1 percent above April’s pace to a seasonally adjusted annual rate of5.35 million units. In addition, the April rate was revised from 5.04 million to 5.09 million units. The continued momentum made May sales 9.2 percent higher than in May 2014 and the 8th consecutive one in which sales were higher on a year-over-year basis. Perhaps as important as the sales numbers was the increase in first-time homebuyers, from 30 percent to 32 percent of the market. This was the highest share for these buyers since September 2012 and was 5 percentage points higher than in May 2014. Lawrence Yun, NAR chief economist, says May home sales rebounded strongly following April’s decline and are now at their highest pace since November 2009. “Solid sales gains were seen throughout the country in May as more homeowners listed their home for sale and therefore provided greater choices for buyers,” he said. Half of US homes are selling in 40 days or less, with nearly 45% of homes sold within a month. The return of first-time buyers in May is an encouraging sign and is the result of multiple factors, including strong job gains among young adults, less expensive mortgage insurance and lenders offering low downpayment programs,” Yun said. The inventory of existing homes for sale at the end of May grew by 3.2 percent from the end of April to 2.29 million homes. This was 1.8 percent more than the 2.25 million available homes in May 2014. Unsold inventory is at a 5.1-month supply at the current sales pace, down from 5.2 months in April. In addition to the all important first-time buyers, Transunion reported last week nearly 1.5 million “boomerang” buyers were able to re-enter the housing market. Those potential “boomerang” buyers are also referred to as “rebound” buyers and were part of the more than 7 million Americans who suffered a major derogatory credit issue – bankruptcy, short sale and/or foreclosure – during the Great Recession. This group of would-be buyers had been in the penalty box serving their mandatory Fannie Mae, Freddie Mac, VA or FHA waiting periods required for most borrowers after they suffer a catastrophic credit issue. With all the potential buyers joining the party this summer promises more good news on the housing front from coast to coast. The US as a whole saw growth, every region. In the Northeast existing-home sales jumped 11.3 percent to an annual rate of 690,000, and are now 11.3 percent above a year ago. The median price in the Northeast was $269,000, which is 4.8 percent higher than May 2014. Sales in the Midwest rose 4.1 percent to an annual rate of 1.27 million in May, 12.4 percent higher than a year earlier. The median price in the Midwest was $181,900, up 9.4 percent from a year ago. Existing-home sales in the West ticked up 4.3 percent month-over-month and 9.0 percent year-over-year to an annual rate of 1.21 million in May. The median price was $324,000, which is 10.2 percent above May 2014. The South there was a 4.3 percent gain to an annual rate of 2.18 million, 6.9 percent above May 2014. The median price in the South was $198,300, up 8.2 percent from a year ago.